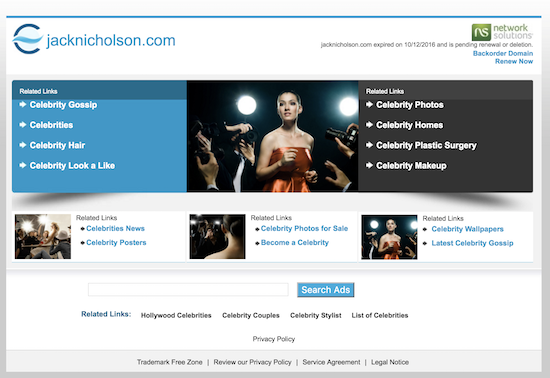 Prior to the expiration of JackNicholson.com, the registrant of the domain name was listed as John J. Nicholson. A Wikipedia page for the award winning actor lists his name as John Joseph “Jack” Nicholson. The last listed registrant email address appears to have been an email address affiliated with a law firm that has an office in Los Angeles. My guess is that the domain name was owned by the actor or someone affiliated with him. I took a quick look through Archive.org, and it does not appear that JackNicholson.com was a developed website. This is the third exact match .com domain name for a well known person that has expired in the last week or so (that I know about). I wrote about the expiration of the BobCostas.com domain name, and Ray Hackney wrote about the expiration of JohnMadden.com. At the time of publication, this domain name is listed for auction on the NameJet domain auction platform. Backorders are being accepted until later on this evening, and it will go to auction on Thursday if the domain name is not renewed today. If this expiration is an error or oversight, I hope the domain name gets renewed prior to the auction. There isn’t much time left to renew though. Obviously, this is unfortunate for Jack Nicholson; but that is the responsibility of his well paid team to renew his IP assets. I find it interesting that some domain investors would be contacting these celebrities without receiving a commission for doing the work their employees should be doing. If you are going to manage the IP assets of celebrities, at least get paid for it…a pat on the head isn’t enough. I would rather reach out to people and remind them to renew rather than have them file a UDRP or have other type of bad publicity for the business of domain investing. The public considers domain investing, to be Cybersquatting. I don’t see that changing, maybe bad publicity is more helpful to celebrities as they will be more diligent in protecting their IP assets. As you said yourself, these celebrities continue to let their domain assets drop; sounds like a lack of accountability and devaluation of domains on their part. You seem to take the position of altruism; which is noble. However, if you are going to be noble, then be 100% noble. Here is a challenge, there is a concept of higher use; I challenge you to donate your self-identified top 5 domains to most likely end user. These are just a few of firms and organizations that would love for you to donate your domains. Talk to your CPA, I’m sure you could get a write-off on your taxes; maybe even an interview in the MSM. That is just silly. Those keywords are generic whereas JackNicholson.com and BobCostas.com are very specific and famous because of those specific people. Have you read some of the UDRP decisions lately? Generic is subjective and malleable in the eyes of these WIPO panels. What you call generic some panelists call bad faith and infringing use. My primary point is that, if you are going to manage the IP assets of these celebrities, at least get paid a commission. And if you want to be altruistic, donate your so-called keyword generics to most likely end-users. Otherwise, you are being a half-hearted altruist. Maybe absurd more than silly. I have seen and written about quite a few UDRP filings against keyword generic domain names. Most are won by the domain owner. Should one of my generic domain names be subject to a UDRP and ultimately lost, I would litigate for reverse domain name hijacking. There is a difference between cybersquatting and investing in generic domain names and luckily there is recourse beyond a UDRP response. I agree there is a difference between cybersquatting and investing in ‘generic’ domains, but ultimately that is a decision that is left to WIPO panels and the Courts. I don’t see things getting easier for domain investors, but more difficult as corporations eventually attempt to steal more domains and make stronger laws against what they call cybersquatting. In the eyes of the anti-cybersquatting, there is no such thing as domain investing, only those in the way of their owning a valued location on the Internet. If you don’t believe that anti-cybersquatting public policy will get stronger moving forward you are being naïve. So, if there are celebrities that are letting their digital assets drop, that their problem. Likewise, if domainers are foolish enough to register trademarks; then they assume that risk, but I don’t think you should manage the assets of celebrities who could care less about you. Case in point…. It’s obvious a screw up by his lawyers who forgot to renew on his behalf. MSK represents him and many other stars. Here is the problem. The network person Rebecca S. linked to the whois email no longer works for MSK. Her employment ended with MSK on August 2015. She was employed since 1997 so this is why she is linked. At this level how such important information is not all linked to one specific company email that more than one person has access to is beyond me. Talk about dropping the ball. I am sure there are hundreds of domains linked to her that no one knows about since she worked for them for almost 20 years. She probably doesn’t even have access to this email anymore and obviously no one else in the company checks it. From my vantage point, the reason that important information is not linked to one specific company email accessible to many employees, is because many corporate users do not place a premium on domains like they would physical/tangible assets like company fleets, buildings, etc. Yes, better to remind them. These are not FAIR GAME desirable assets like good generics. I wonder: do “they” sometimes do this as a publicity stunt? Domain expires, headline grabbing drama ensues if someone grabs, “no publicity is bad publicity,” yada yada. I mean, is it really that likely by now that these things can be an “accident” or true oversight anymore at that level of fame? A 1998 registration plus the details I provided clearly shows it was an oversight. They simply had no clue. Looks like this was just renewed.